The Strong, Empowered, & Classy Project highlights the people that know how to surpass boundaries and live happily despite life’s major woes. In this episode, Kristen Hayman (@MsJaneThang) sits down with Storie Devereaux (@StorieDevereaux), a vocalist/poet, Chicago’s latest viral sensation and #Storieteller, as she shares how Strength, Empowerment and Class has taken a role within her journey through life. In this two part episode, we discuss a range of topics that include the Passion Behind the Stories, the Power of Expression, the Importance of Listening and the overall Connection of Love and Humanity. Also, check out Storie’s hilarious video that went viral on Facebook in December/2015 after Chicago received it’s first big snow storm of the winter. Watch it here. Thank you for visiting www.janethangproductions.com. 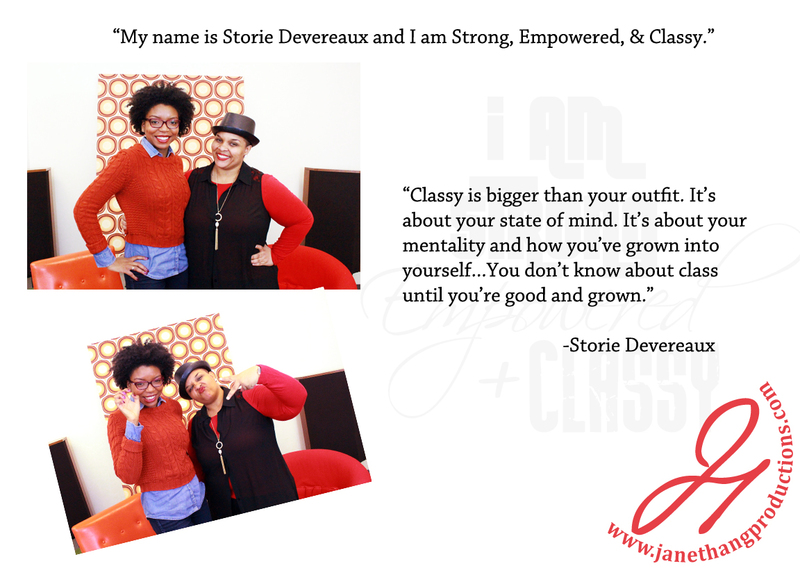 Be on the look out for more sources of inspiration from the Strong, Empowered, & Classy Project each week! We are truly thankful for Storie Devereaux’s participation in sharing her powerful perspective with us. Be sure to stay connected with her on the social media links listed above and if your are in the Chicago area, I hope to see you at her event, DirtyRedVinyl: Unplugged that will be held on February 14th at The M Lounge, from 6:30pm to 8:30pm.